I’m a big-screen fan. It’s the reason my primary Mac is still a 17-inch MacBook Pro, and why I have that hooked up to a 27-inch Apple Thunderbolt Display when I’m in my home office. When travelling, though, I have fewer pixels to play with. Sure, I could get a 15-inch Retina MacBook Pro, but I favor physical screen space over smaller screen elements. There are existing apps out there, like Air Display, that let you use an iPad as a second monitor for a Mac, but they work via WiFi, which poses two problems. First, they often don’t work on WiFi hotspots, which you’re likely to be using when away from home. Second, even when they do work, there is an annoying amount of lag. Setup is very straightforward. Install the Duet iOS app on your iPad, then install the companion menu bar app on your Mac. You need to restart your Mac after installing the companion app, and then you’re done. You can also run it on an iPhone. On an iPhone 6, it would be pointless, and I’m not convinced it would be that much more useful on an iPhone 6 Plus, but the option is there if you want it. To use your iPad as a monitor, simply connect it to your Mac using a standard Lightning or 30-pin cable (I use an Amazon Basics one, mostly because it’s black …) and launch the Duet app on your iPad. Within 2-3 seconds, the Mac will automatically detect the iPad and start using it as a second monitor. I found the first time I connected it, it set the iPad screen to be the main one, with the dock and menu bar over on the iPad. This looked rather funky, giving a sense of what an iPad running OS X would look like, but isn’t the most useful setup. 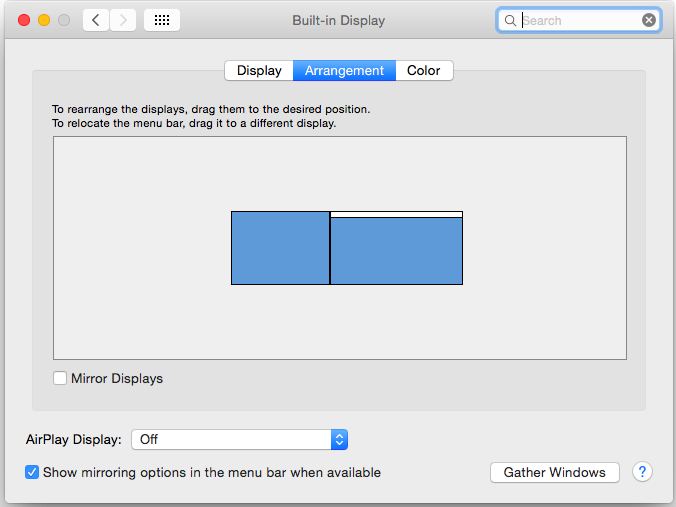 Reversing that works the same as any other external monitor: just click the Arrangement tab and drag the menu bar back to the Mac display. In subsequent launches, Duet remembered this setting, so it was a simple, one-off task. You can also use it as a third monitor alongside a conventional one if desired. I have two Macs: a heavily-upgraded late-2011 MacBook Pro 17, and a 2013 MacBook Air 11. Duet says that the app works only with 2013 Macs and later (running OS X 10.9 or later), and this is pretty much correct–but not the whole story. Updated: My usage on my MacBook Pro 17 was carried out with pre-release software, in which cursor-lag was horrible. But with the latest version installed, responsiveness is–while still compromised–is still perfectly usable. One really nice, uh, touch with Duet is that you can choose to control the apps on the iPad monitor using your Mac touchpad/mouse, or the touchscreen display on the iPad–switching back-and-forth between the two methods as you like. It’s really quite fun to explore what OS X would be like on a touchscreen device. Obviously it’s not designed as a touchscreen OS, so a lot of the user interface elements are rather small for a finger, but for things like weblinks, it makes for a convenient additional means of control. 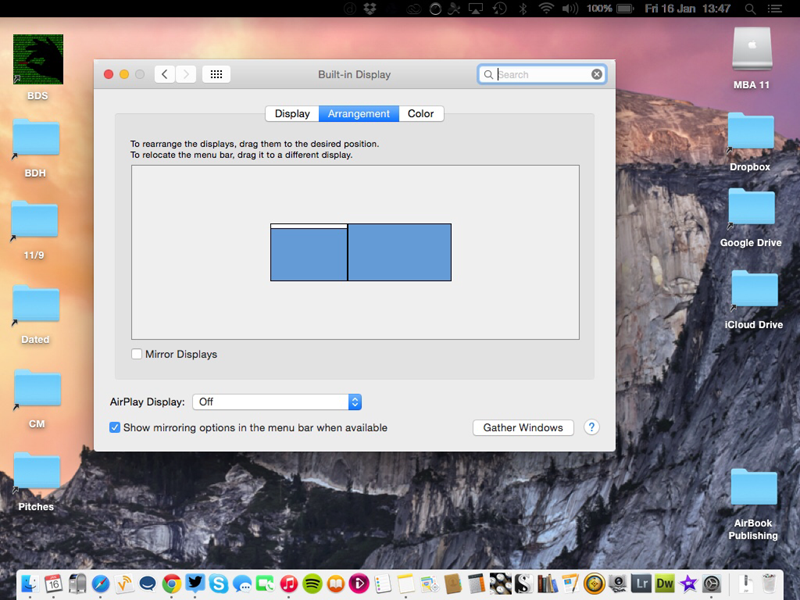 Generally when using an external monitor, it will be larger than your Mac display. In this case, it’s smaller, which means any large windows you drag across to the iPad will need resizing. It’s easier to make them small before you drag them and then resize them as desired once positioned on the iPad. I found that if I let my Mac go to sleep, it wouldn’t always automatically reconnect to the iPad. Sometimes it did, sometimes it didn’t. When it didn’t, not even relaunching Duet on my iPad worked: I had to quit both iOS and Mac apps, disconnect the Lightning cable–then relaunch both apps and reconnect the cable. Conclusion: set your Mac not to sleep when using the app. Things were fine at the iPad end: I could switch off the iPad when I didn’t need the second monitor, and it would reconnect to the Mac within a few seconds of switching it back on again. Same thing when disconnecting and reconnecting the cable. You can also use other iPad apps and just pick up where you left off when resuming Duet. I love it. Used on a recent Mac, it’s as good as a conventional monitor (albeit a small one). Those who use chat apps for work will find it especially useful, enabling you to keep an eye on the chat while still retaining full use of your Mac screen for your actual work. Even on older, theoretically incompatible Macs it is still useful for some applications. Granted, there is extreme pain involved in getting the app window positioned on the iPad in the first place, which could literally take several minutes when using my MacBook Pro 17, but once it’s there, it works just fine for things like Hipchat. It claims to work fine on older iPads. At $14.99, it’s one of the more expensive iOS apps around, but given the boost it will give to your mobile productivity, I think it’s excellent value for money. Duet requires a modern Mac running OSX 10.9+, and an iPad running iOS 7+. The Duet iOS app costs $14.99 from iTunes, while the companion Mac app is free.